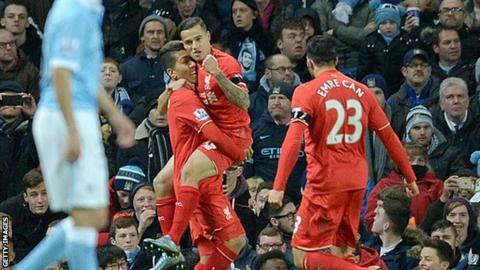 Man City v Liverpool: Who were the best and worst players? Chief football writer Phil McNulty selects his best - and worst - performers from Manchester City v Liverpool. Do you agree? Have your say on the Match of the Day Facebook page and join in a Q&A with Phil. The little Brazilian had been a shadow of himself under Brendan Rodgers earlier this season - but with the arrival of Jurgen Klopp he has been rejuvenated with two goals in the win at Chelsea and a masterly display here. When he plays well, Liverpool play well. The £29m signing from Hoffenheim made a slow start but Klopp was an admirer from the Bundesliga and clearly regards him as an important player, using him in an advanced role in preference to Christian Benteke in the away games at Chelsea and here, where he showed his class again. Another player feeling the benefit of Jurgen Klopp's arrival. The Germany international was shifted all over the place by Brendan Rodgers, including right-back and part of a three-man central defence. Klopp has put him in his familiar midfield role and he helped to create Firmino's brilliant third. Certainly not blaming this player for Manchester City's shocking defensive display but his early own goal increased the nerves and uncertainty, underlining just how much they missed captain Vincent Kompany.